Ea O Ka Aina: Keep the lights on in England? SUBHEAD: In the UK’s scramble to “keep the lights on”, the new government should listen to its favorite newspaper. 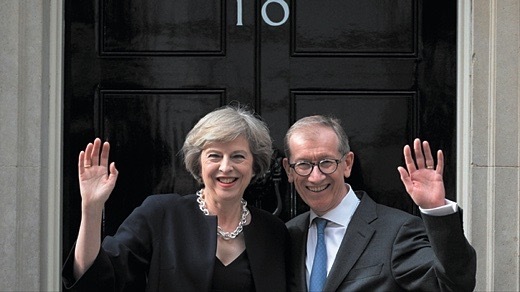 Image above: Theresa May, the new Prime Minister, at 10 Downing Street with her husband Wallace Gromit. From (http://www.rechargenews.com/solar/1443571/opinion-uks-government-should-listen-to-its-favourite-media). Given that energy is the essential bedrock of a healthy economy, it is both frustrating and bewildering to watch a protracted national debate like the one accompanying the Brexit referendum and its aftermath and see how little time and attention is allotted to energy policy. In the run up to the referendum, I saw hardly any coverage of two towering themes that will be familiar to all with an interest in energy these days. The first is the speed with which a clean energy insurgency is invading energy markets around the world. The second is the speed with which the energy incumbency is unraveling, both in the face of the invasion, and a wider array of old-age problems. Both themes could hardly be more significant for the UK economy, for two particular reasons. The longer we continue to flog the dead and dying horses of the incumbency, the more our economy will miss out on the fruits of clean energy. And crucial to the Brexit outcome, the more we distance ourselves from pan-European markets and policy making, the more expensive clean energy is likely to be, and the more difficult it will be to access at scale. A related question is how we keep the lights on, given how many British power plants are nearing retirement. Whenever this issue is discussed, the chaotic state of UK energy policy quickly becomes apparent. In the article, international business editor Ambrose Evans-Pritchard presented such compelling evidence for the soaring prospects both of storage and renewable power that it must have left more than a few of his readers shaking their heads in wonder that so many of their fellow Conservatives can remain wedded to the receding prospects of new nuclear power and shale gas in the UK. All this year I have kept a monthly blog summarising progress in energy and other fields related to climate change. This series of eight articles captures both the two themes I write of here – disruption by the insurgency and implosion of the incumbency – telling what is essential a tale of global business system-change unfolding before our eyes. Consider for example the economic challenges facing those Conservatives who remain hopeful of drilling their way to shale riches and building new nuclear, meanwhile suppressing the kind of clean-energy prizes described so well in their favourite newspaper. The shale industry they seek to emulate and import is in large measure going bankrupt because of something we hardly ever hear about in the UK media: the oil and gas industry has been drilling for years at a cost of recovery in excess of the cost for which they can sell their hydrocarbons. As chickens come home to roost in this junk-debt feast, 90 US shale drillers have already filed for bankruptcy. Many others will follow, because banks have started to call in loans. The drillers have innovated to cut their costs, but still they are mostly unprofitable, and will remain so as long as the oil price stays low. If it rises, and moves above $90, growing numbers of consumers will be unable to afford oil and gas, and clean energy will will look even more attractive. Do Mrs May and her troops think the economics of shale are going to be any different this side of the Atlantic? They are very likely to be worse, even if gas proves extractable in commercial quantities from Britain’s shale, which is more geologically complex than its American equivalent. The reason for this is that the UK government has insisted that environmental regulation will be tougher here than in the USA, which for much of the shale boom has operated with the kind of rulebook a developing country might be ashamed of. (That has been changing fast this year, adding to the dismal unprofitability of most US shale gas). As for Hinkley Point, I covered the monstrous economics of that in my June column. Since then, the plight of EDF has worsened. Another conservative organ covered this well in August. “Hinkley Pointless”, read the Economist’s headline. The article points out that the National Audit Office has verified figures showing that solar and wind are cheaper than nuclear today, never mind in the mid 2020s when the power plant might eventually come on stream, in the vanishingly improbable event that EDF can correct their ghastly catalogue of operational disasters in the interim. “Britain should cancel its nuclear white elephant and spend the billions on making renewables work,” the Economist announced. Yes, but let us not forget energy demand management. In this, the quickest, cheapest, and most important route to keeping the lights on, the UK energy scene is just as chaotic as generation is. But that is another story.